We are one of the foremost firms of Kids Jumbo Stroller, based on sophisticated techniques. Keeping in mind the diverse needs of cute infants, we come up with a comprehensive range of Luvlap Sports Baby Stroller. This product is widely appreciated for its optimum quality which is designed utilizing high-tech machines in compliance with set industry norms. 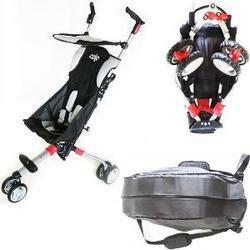 We are a unique name in the industry to provide our prestigious clients an exclusive range of Kids Stroller. - Removable armrest bar helps to put baby in/out with ease. - Bi-folding mechanism is easy to carry and store. - Reliable and portable shoulder strap. Adjustable handle for mommy height. 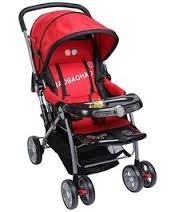 Enriched by our vast industrial experience in this business, we are involved in offering an enormous quality range of Fancy Baby Stroller (Baby Buggy). We Offer High Quality Pram Strollers in the Vivid range of Sizes & shapes. No matter where or how you like to travel, the lightweight BRITAX HOLIDAY is the perfect companion for your trip. Thanks to its compact folding format and carry strap, you can quickly and easily pack it up and leave for you next destination.